We offer the latest and most advanced tooth replacement treatments at a price you can afford. 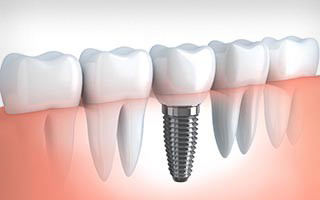 A dental implant is a small titanium post which is an artificial replacement for a missing tooth root. Dental implants are the latest treatment used to replace gaps in the teeth left when teeth are severely decayed or lost through injury. The implant is used to replace the damaged root of a tooth; it is fitted into the socket in the jaw bone and attached to a new crown. In some cases, the implant may be fixed to a dental bridge or a denture. Dental implants are manufactured using a special type of titanium alloy, which does not irritate the tissue in the gum. What implant system do we use? Sussex Dental Group strive to provide the latest and most technologically advanced techniques that strictly adhere to UK and EU regulations. The Ankylos implant system is a German manufactured product that is dependable and well-designed and provides you with solutions that deliver long-term stability of hard and soft tissues, lasting aesthetics and reliable functionality. It is such a trustworthy brand that the Implants are backed by the manufacturer with a lifetime warranty. How are the implants fitted? Before the procedure the patient will be given local anaesthetic to ensure they don’t feel any pain during the treatment. The dentist will make a small hole in the jaw bone, in which the dental implant will be held in place. The implant is attached to a temporary crown for a period of around 3-6 months while the gum around the implant heals and the bone tissue develops around the titanium implant. Once healing is complete a permanent crown can be fitted. Usually, the procedure to fit a dental implant takes between one and two hours. You will be required to attend follow-up appointments and your dentist will discuss this with you after the procedure. Some patients find it beneficial to take a couple of days off work after having an implant fitted. Patients with missing teeth may also consider having a dental bridge or a set of partial or complete dentures. However, dental implants are widely regarded as the best treatment as they last for much longer and do not cause any discomfort. What are the benefits over bridges and dentures? There are many advantages of dental implants over both dentures and dental bridges. The most attractive advantage is the fact that the implant lasts for a lifetime if it is carefully looked after, which will prevent having to have numerous dental appointments to replace or adjust restorations and dental devices. Secondly, dental implants are much more comfortable than dentures. Once the implant has healed fully, the tooth will work in exactly the same way as a normal tooth. Some patients find dentures are rather bulky and can cause discomfort; in addition dentures may limit what foods they can eat. Dental implants also discourage bone loss, which can cause problems and result in teeth being lost. Dental bridges can only be used when the teeth surrounding the gap are healthy and strong, while dental implants are supported by the jaw bone and will not affect the other teeth. Are dental implants always a success? In the vast majority of cases, dental implants prove to be an extremely effective treatment. Titanium implants have been used for many years now and the success rate has consistently been over 90 percent. Are there any risks or complications involved? Like all procedures, there are risks of complications; however, these are extremely rare. Possible complications include damage to the surrounding teeth and gum tissue and a lack of integration between the implant and the jaw bone (this may prevent the implant from fitting properly and will mean it is not fully supported by the jaw bone). The dental team at Sussex Dental Group deliver excellent standards of care and will do everything they can to make your treatment as effective as possible. Dental implants are not suitable for everyone but they can be used on most patients. The success of a dental implant procedure is largely dependent on the bone density in the jaw; there must be enough bone and the bone must be dense enough to support an implant. Nowadays, dentists can perform bone grafts on patients that don’t have sufficient bone mass in their jaw; this involves using bone from other parts of the body to build up the bone mass in the jaw. The procedure is fairly straightforward and makes it possible for most people to have dental implants. Children are not advised to have dental implants because their jaw bones are not fully formed. Your dentist will be more than happy to discuss treatment options with you and help you decide which treatment is best for you.